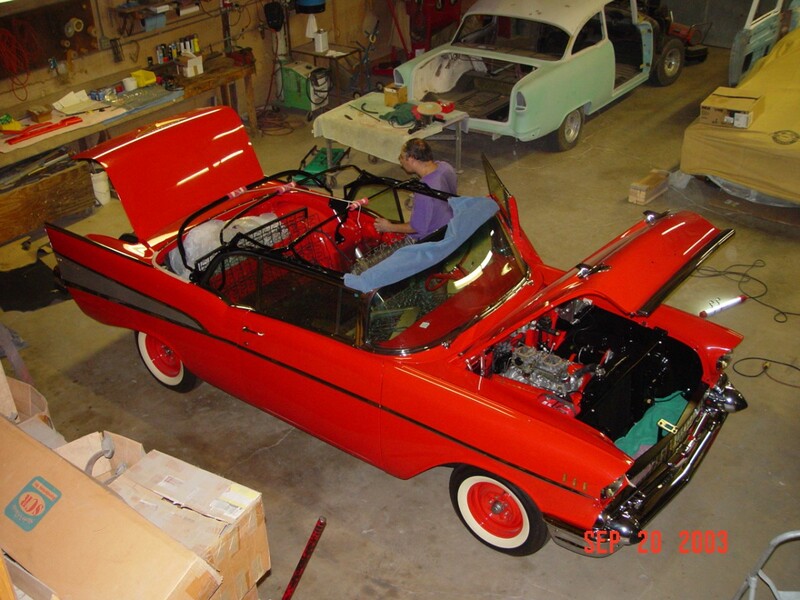 Talk about a great family car for summer cruising! 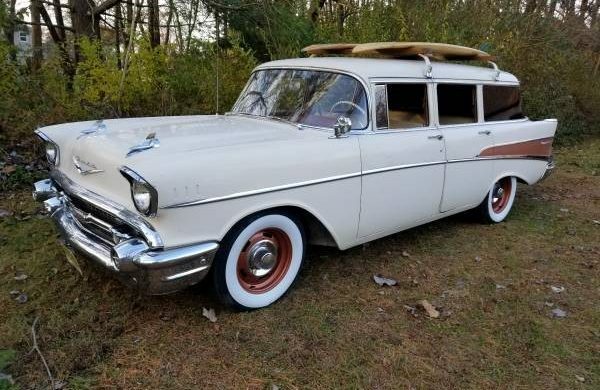 This 1957 Chevrolet 210 Wagon is said to be a mostly original survivor and looks like a ton of fun. 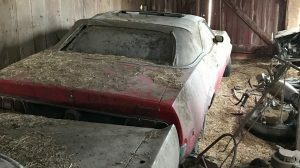 Thanks to Barn Finds reader bw for the tip on this awesome car. 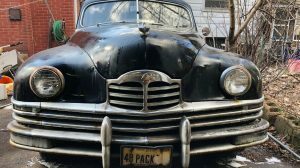 Found here on Craigslist with an asking price of $16,900, the cool cruiser can be found in Woodstown, New Jersey. Some people will say it has two too many doors, but I think it’s still very cool. How about you? The interior will immediately transfer riders back to the late 1950’s. It looks to be original and in decent shape. The interior color scheme matches the exterior perfectly. Unfortunately there are no pictures of the engine bay or the rear cargo area. The engine is a V8 with an automatic transmission. The body looks pretty good. There is reportedly some rust in the back door opening, but it’s said to be not bad. Overall, this does appear to be a solid, mostly original car as stated. The four-doors will be a drawback for some people, but if the new owner plans to use it as a family car, four doors is just fine. The ad does state that the car was repainted years ago and there have been some wear parts replaced (tires, brakes, bearings, etc.). The new tires look great and with the addition of the surfboards, they really make the whole package come together. I love it. I don’t care about the two extra doors on a wagon. 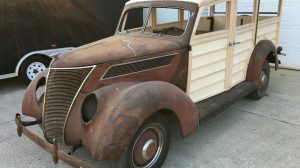 The repaint concerns me a little, because who knows how much mud and rust is beneath? I’d want to see some before pictures if I was serious. Most guys that restore old cars take pictures of the process. It would answer a lot of questions. 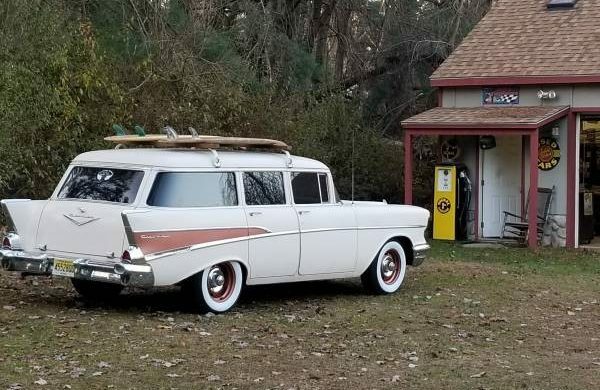 I am kind of curious how every other wagon is cool, but on this ’57 the comment is made how it has too many doors. Yes I know the Nomads exist, but if we are wagon lovers, then this certainly has to be pretty far up the list. Four doors on a wagon work for me, or on any other car. So much nicer for loading gear and friends. Unsure on the price, but I really like it. Wheels look great also. Wow. 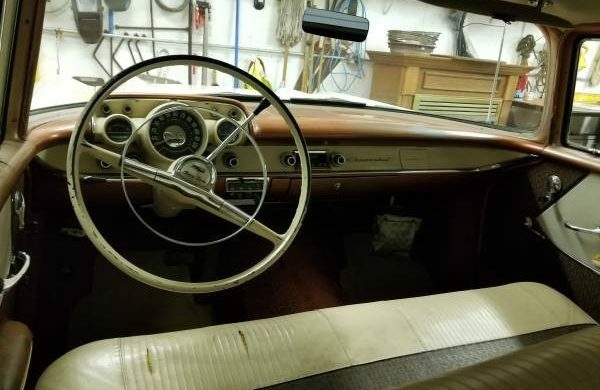 Sahara Gold/Adobe Beige 2-tone option for 1957. However, roof and fin got the opposing color from the factory. 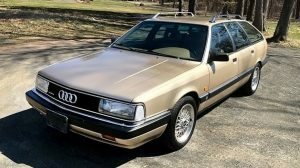 I thought my father was the only one in the country to order a 210 Wagon, 283/ Powerglide in Adobe Beige and then have the dealer paint the fin trim area only Sahara Gold. It would look a whole lot nicer with beauty rims. Kind of interesting. Rims and whitewalls look odd to me. However, I have seen several 57s with similar rim/hubcap configuration so it must be somewhat popular. I too have a 210 4 dr wagon in the copper cream combination purchased from the original owner family. It is a blast to drive. I’m in the process of rejuvenating all of the body. Now. Ok. Now, you’ve got me salivating!! had a ’57 210, 2 door post with a hot 283, 3 on the tree with overdrive. Also had a few chances to get a ’57 station wagon. Never pulled the trigger. Wish I could now! Color me frustrated. Lol. $16,900.00 is also too high. In my mind, it is only worth half that…tops. This was before GM did a disgusting political things and built real cars! I actually used to like bow ties! This is a awesome example! Rims are from a later model Chevy as are the hubcaps. No big deal. Nice to have wider rims on a wagon, anyway. The car most likely came with a 283 two barrel. the V-8 emblems back and front. 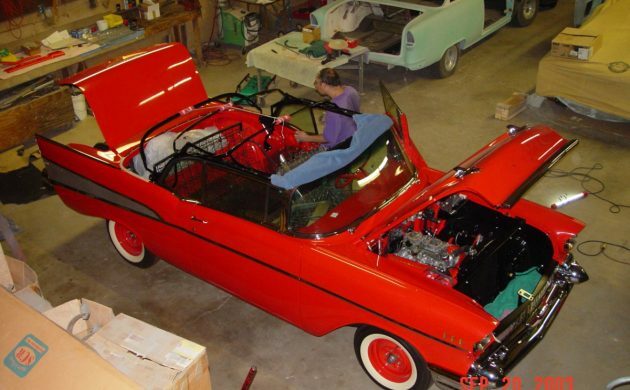 Most likely the car was built in Baltimore Tarrytown, NY, or Norwood OH. Look out for rust on many if not most of these cars. I like that wagon, I am thinking about 12K maybe a touch higher. That rear drivers door is not aligned exactly right. What corrosion lurks underneath that swell carpet? As stated before me, What was done before it got painted years ago? Still I think you have a lot to work with if you wanted to finish it up to righteous.